Emsisoft Anti-Malware is a free premium malware scanner to clean and protect your PC from viruses, spyware, trojans, bots, adware and worms. It uses 2 major scan engines to find more than 4 million different types of malicious software. Keep your PC clean with the included File Guard and Behavior Blocker features that effectively stop all new infections. The Surf Protection additionally blocks access to fraudulent and dangerous websites. Emsisoft Anti-Malware was awarded as best Antivirus of 2009 by PC Security Labs because of its outstanding detection rates in all malware categories in all comparative tests 2009 - beating about 30 well known antivirus tools. Many other independent tests confirm the world class level in virus detection. 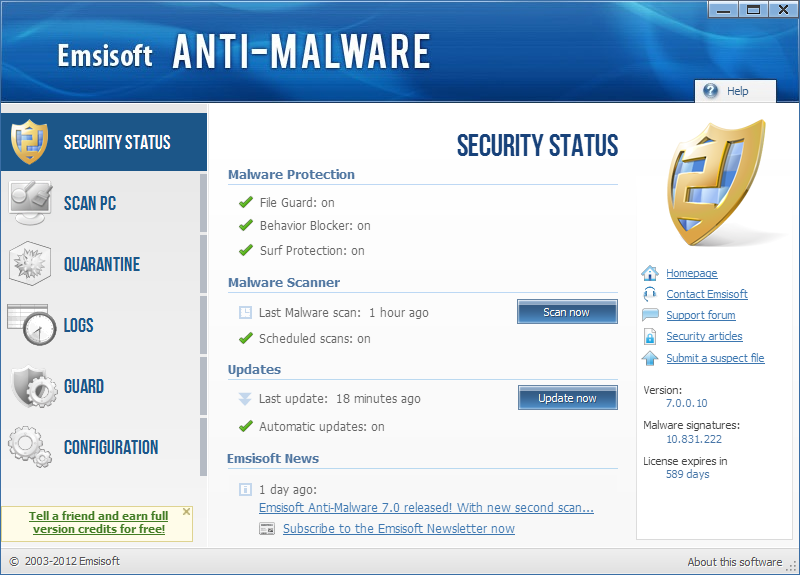 Check out the latest tests on www.anti-malware-reviews.com The Emsisoft Anti-Malware realtime protection uses 3 layers to protect your PC against new infections: * The signature based scan by the dualengine catches known dangers immediately when they try to run or are being downloaded from web. New malware definitions (signatures) updates are available at least 5 times per day. * With the awarded unique behavior based malware detection, all running programs are monitored all the time. As soon as a program does something suspicious, it is stopped and alerted. Providing you the ability to interrupt unwanted actions. That provides extra security against new and unknown threats that others can't catch. * The surf protection prevents you from surfing to malware spreading and fraudulent websites. Extras: Emsisoft Anti-Malware holds plenty of advanced options for experts to detect and delete malware manually. For this purpose the integrated system analysis tool HiJackFree is included. Conclusion: Emsisoft Anti-Malware is a comprehensive tool to detect all types of Malware, Viruses and Spyware. With the automatic update feature, your PC is always up to date to protect permanently against dangerous software.